Anyone who has spent any time in woodworking knows that it’s expensive. It doesn’t matter if you do it as a hobby or as a profession. Good equipment is never cheap. They will tell you to buy once, buy quality. That’s a very good principle. It is cheaper in the long run. There’s no sense in doing things the wrong way. But there’s another approach that is equally as valid: Get good equipment to learn with and later purchase the better equipment as it comes available. There is a lot of good equipment out there for bargain prices — if you’re willing to be a patient shopper. You may need two or three years to acquire it all but it will be worth it. It was for me and I suspect it can be for you as well. #1 Table saw. The first thing you’ll need i s a table saw. Budget $250 for this, though you can probably get one for a lot less. My first decent saw was an older belt-drive Craftsman 113 series “contractor” saw. It has plenty of power. These are sometimes available for less than $100, but often between $100 and $150. Add the remainder of the budget for a quality fence. It makes all the difference in the world for getting a good cut. It really does. You’ll never regret getting one. And later should you upgrade to a better saw you can take it with you. A contractor type saw has some shortcomings. One of them is a matter of safety. Few of them have a thing called a riving knife. It’s a blade that sits behind the rotating saw blade and serves to keep the sawn pieces separated. Without it you risk “kickback” where the saw picks up what you are cutting and throws it back at you. (It happened to me with a small sheet of 1/4″ plywood and boy does it hurt! Yes, it is quite dangerous.) Because of this lack you need two pieces of safety add-ons. The first will cost just a few dollars and they are called splitters. They mount behind the saw blade and do pretty much what the riving knife does. Expect to add $30 – $40 for a splitter set. This might even fit into the $250 budget. The second thing is to build a sled. 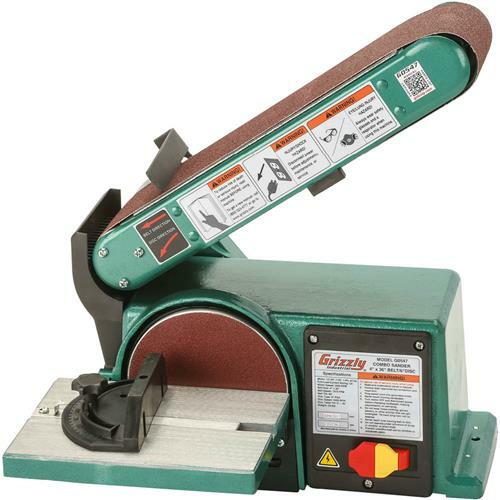 This is a nifty gizmo that lets you cut pieces at a perfect 90 degrees without the use of a clumsy miter in the slot. It’s like a miter that rides in both slots. All it requires is a piece of plywood, a few screws, and a couple of 2x4s. $20 can cover it. This puts us between $250 and $300, and that’s the worst case. #2 Router. Almost any router will do for starters. Just be certain that it will accept both 1/2″ and 1/4″ bits. The larger bits will work with heftier routers and will do a better job on the harder woods. That means with a $200 budget you can get a very nice used router for $100-$150 and the rest for quality bits. Yonico bits do a good job. The Freud, Whiteside, and other high-end bits are worth the difference once you start doing a lot of work. One should generally avoid used bits. This makes our total $450-$500. #3 Wor kbench. 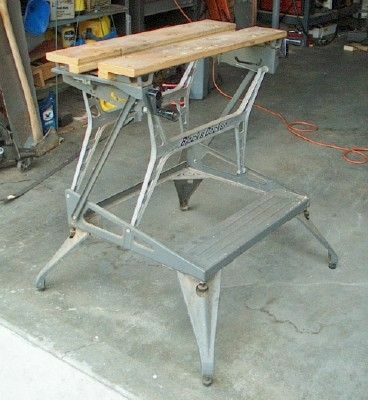 The older Black & Decker Workmate benches go pretty cheap. I get them at auctions and yard sales for anywhere between $10 and $25. The older units are lighter than the modern ones and the stand better when folded. They make a good workbench (dual-height) and vise. For an assembly table I lay a hollow-core door across two of them. Two is plenty to begin and you shouldn’t have to spend more than $50. I’ve collected 10 of them. In my garage shop I’ve used 4 at a time for assemblies. For larger projects like painting where the wife sets things on or between them on boards (outside), we’ve used all 10. That’s about all I’ll ever need. But I needed every one. Your needs may vary. And if you find that the Workmate approach isn’t for you they’re very sellable items. Someone will want them. That puts us at $500-$550. #4 Sanders — Sheet, Belt, and Spindle. You really do want all three types of sanders. With regard to belt and spindle types, depending on the size of things you build they may not be two separate piece of hardware. There is an all-in-one unit that does both. You can find it with the Ridgid or Wen name on it, and probably others. If your shop needs to be compact that’s a practical option. There are also bench sanders that contain a disc as well as a belt. 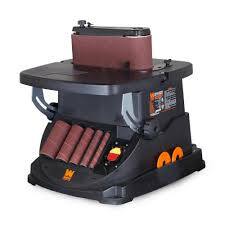 The end of the belt can serve the purpose of the spindle sander for things like curved table legs. To see them in action you may want to spend some time on YouTube watching videos. Depending on application (i.e., your needs, one may do the job better than the other. 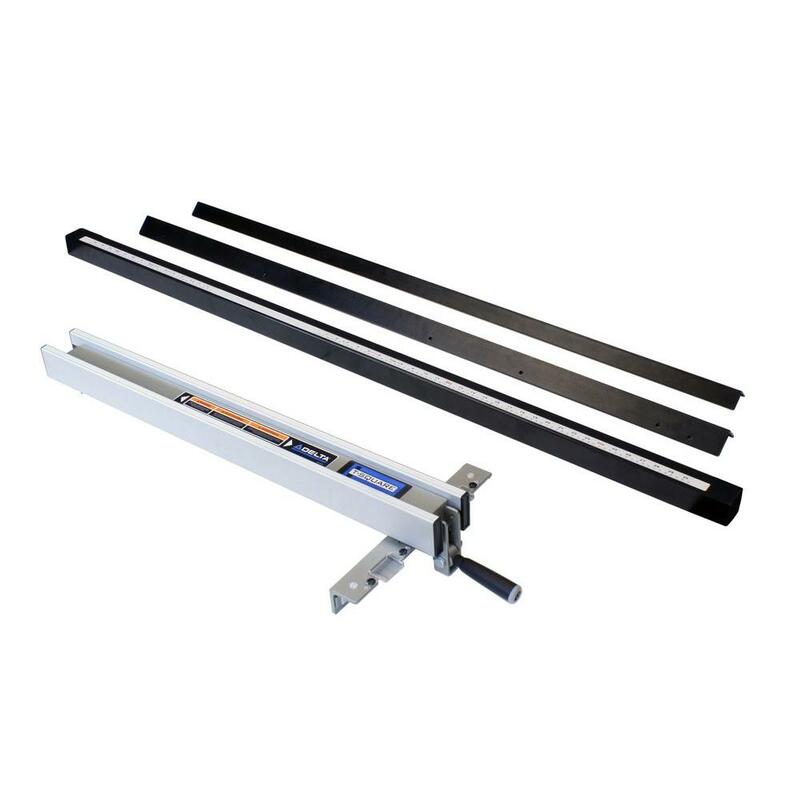 Sheet sanders are the easiest to find used. I see them in thrift shops for $10 – $15. Sometimes they need the pad replaced but often not. Bench sanders often go for $25 to $50 at auctions. This is one item where you may spend a lot less than what you’ve budgeted. Allow $25 for sa ndpaper to get started. $200 should easily cover your sanding needs. That puts us at $700-$750 at the outside. 5. Drill Press. 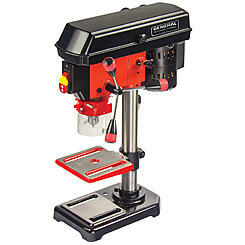 The final must-have is a drill press. For the small shop most any bench press will do. There are a number of 3-speed belt drive units available for $100 new, and much less used. Check out Sears and Harbor Freight. Now w e’re at $800-$850. 6. Clamps. You’ll want a number of these. A dozen 6″, a half-dozen 12″, and a half-dozen 36″. And that’s just to get started. Harbor Freight has 6″ for $3 each, 12″ for $4 each, and 36″ for $8 each. That’s about $108 for a full set of clamps. It’s one of the few things I buy at Harbor Freight. They’re not the finest clamps around but they will get the job done, and that’s enough for the beginning shop. Like the power equipment they can also be upgraded later. What to do with the extra budget space? A. Glue. You’ll need to glue things up. Gotta give those clamps a reason to be there. B. Hardware. You’ll need screws for putting things together. C. Wheels. You may want to throw together carts to roll things around in a small shop. D. Storage. Perhaps some wood to build wall cabinets or shelves for storing your hardware and other accessories. E. Dado blade. Because you’ll want to cut wide slots, lap joints, and tenons from time to time. Just don’t buy a cheap one. A good one used is ok. But cheap ones will not give you a square cut. You easily afford this if you can get a bargain on your router. There are other things that make for a full shop. 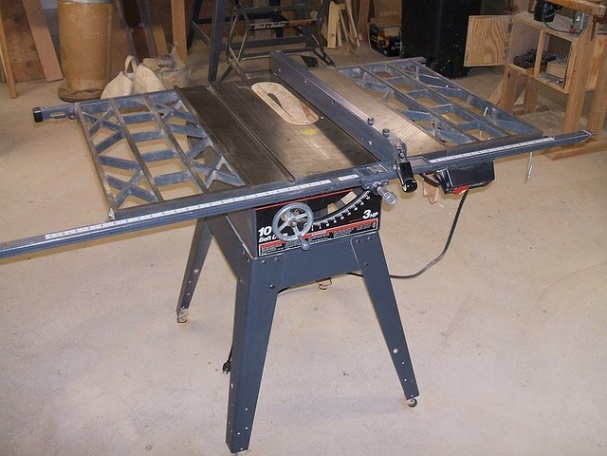 Later on you’ll want (and need) both a jointer and a bandsaw. Starter units for these can be had for $500 for the pair. But that’s another $500 that you may not have. The goal here was to say under $1,000 and make a useful shop. That we’ve done, and with some room to spare. So there you have it. A useful woodworking shop for a modest price. Now go build some stuff.